With a new species of shark (the Crocodile shark) being washed up on a UK beach last week we look at the ongoing theory that perhaps one day a Great White will make headlines and will also be discovered in British waters. Originating from the UK (the Island of Jersey), this story has captivated me my whole life. After working with White sharks in both South Africa and Guadalupe Island for the past 8 years the theory of White sharks visiting UK waters has never gone away, in fact it has become even more captivating for me. Although there are no “official” reports of a Great White in British waters, there are plenty of other species that call the UK their home…..The UK is in fact one of the best places in the world for encounters with the 2nd largest shark, the Basking shark. During summer months, when the plankton blooms, these enormous animals can be seen in great numbers right along the coastline. Makos, Threshers and Porbeagle sharks are all residents as well. These 3 species all belong in the same family as Great White sharks. Other species seen over the years include Blues, Smooth Hammerheads, Greenland sharks as well as many smaller species of Tope and Cat sharks. There have been countless eyewitness accounts of supposed Great White shark sighting over the years dating all the way back to 1960s fishing tales. Although none of these accounts have hard evidence, some of them are very credible. 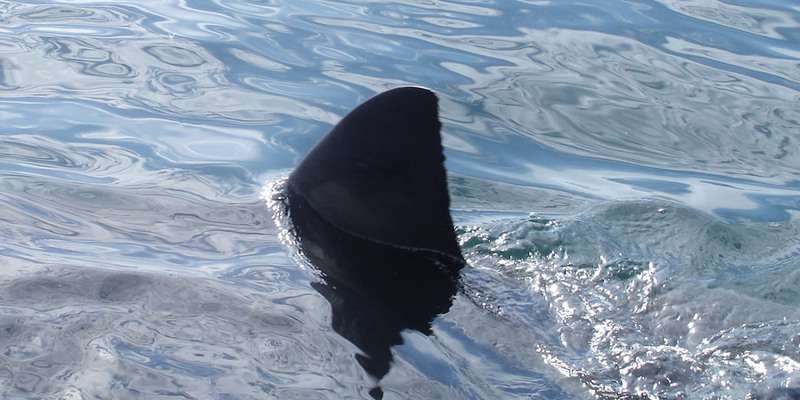 One of the most famous was back in 1999 when a group of anglers off the coast of Cornwall claimed to had an encounter with “a large shark, with big dark eyes and a White underbelly.” Other sightings have included seeing breaches, predations and in water encounters. Most of these sightings are focused in two areas, the south coast of England and the outer islands off Scotland’s north coast. Is it even possible for Great White sharks to survive in the UK and what would be the reason for their visit or residency? White sharks are essentially warm blooded creatures that can tolerate (and even prefer) cooler temperate water temperatures. Temperatures in the UK are perfectly adequate for White sharks when compared to temperatures around Cape Town and New Zealand’s south Islands (two well known White shark hot spots.) So what could they be eating? As well as its high fish stocks (especially in the summer months) the UK also hold 95% of the European population of Grey seals making this an ideal hunting ground for large predatory sharks. If Great White sharks are not residents to the UK, could they be migrating here and if so, where from? For me there is two possibilities. The first is that we get occasional visitors coming from the Mediterranean population of White sharks. There are multiple accounts of White sharks throughout this ocean, the most northernly account was from the Bay of Biscay (just over 30 miles away). This distance is nothing when compared to the distance Great White sharks can migrate. The second theory is that sharks from the East Coast of the United states are migrating across the Atlantic. Perhaps to give birth in warmer waters (such as the Mediterranean) before stocking up on the food abundance around the UK before making their way back again. My theory is that White sharks are not resident to the UK but I can see no reason why we do not get the occasional “seasonal visitor”. Conditions are fine for them, temperatures and food sources both tick the right boxes and from what we know about these animals migrations, it is not a stretch to think that they could be coming from a far. If and when a Great White shark is spotted in British waters it should generate fascination not fear. The UK and its surrounding water should be proud to be able to name one of the planets most incredible creatures on its list of diverse and majestic wildlife. Until that day, the search and mystery continues…..